Credit card companies have $25 billion reasons to get you to overspend. Use this guide to credit cards to understand all the sneaky ways they do it. Visa and Mastercard booked $25.9 billion in revenue last year. That’s money moved from your pocket to theirs through interest, annual fees and other charges. And that’s just the top two credit card companies. The industry books hundreds of billions a year and all driven by getting you to overspend. Besides the money they collect from you, credit card companies get a percentage fee on each transaction from the merchant. It may only seem like a percent or two but it adds up to billions. So credit card issuers have a strong incentive to keep you reaching for your plastic and they’ve gotten quite good at it. A Dunn & Bradstreet survey found that consumers spend up to 18% more when using a credit card compared to cash. McDonald’s reports the average purchase paid for with credit is $7 versus just $4.50 when cash is used to pay. It’s legal loan-sharking and little is done to protect the consumer. Credit card overspending costs people more than just that 20% annual APR, it makes it harder to budget and forces you into a debt trap that makes it impossible to save for retirement. 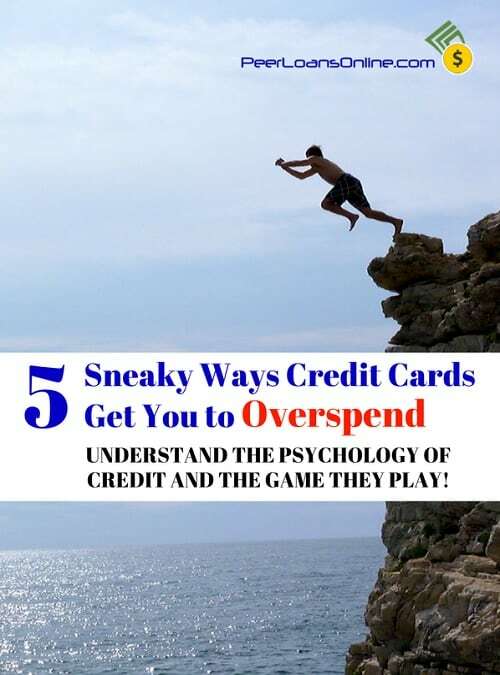 Avoiding overspending on your credit cards means understanding the psychology of credit and the ways credit card companies use to trick you. Studies have shown that the brain reacts differently when you pay by credit card versus paying with cash. Researchers are actually able to measure consumers’ perception of pain and paying with plastic doesn’t trip the same triggers as handing over cash. That doesn’t happen with credit cards. You may have thousands left on your limit so spending $50 or even a few hundred doesn’t matter as much. There’s no mental budgeting to slow you down from using the card again and overspending. Credit card companies have even been able to associate their logos with spending through powerful conditioning. A series of experiments by Dr. Richard Feinberg found that people were more willing to spend just by showing them logos of credit card companies! Not only do credit card companies use psychology to get you to overspend, they use it to get make more on interest payments. A paper published in the Journal of Marketing Research found that people are driven to attain small goals. This means people are psychologically-driven to pay off small debts first even if others have higher interest rates. The result, people run up huge bills on their credit cards and turn their focus to paying other bills while paying double-digit rates to the credit companies. Finally, credit card companies are masters at the psychological incentives of rewards. Offering ‘cash back’ programs and rewards drive consumers to overspend way beyond their budget. Many card companies even use tiered rewards systems so the more you spend, the more rewards you ‘earn’. Credit card rewards systems turn consumers into Pavlovian dogs! Just as a dog that hears a bell and gets a treat, you are being conditioned to spend more by rewards incentives. The problem is that the payout on rewards is far less than you end up paying in interest and fees. Now that we know how credit card companies use psychology against you, it’s easier to see through five common credit card tricks that get you to overspend. By using psychology, credit card companies are able to design programs and messages to reinforce overspending. Credit cards minimalize how much you owe. They do this by showing only the minimum you need to pay each month. Knowing your payment is only $100 is much easier to stomach than realizing you are $10,000 in debt. Your minimum payment will be the first thing you see on your statement, in bold letters to get your attention. The total account balance is usually buried further down with other numbers including the amount of interest you paid last month. Credit card companies ‘reward’ you by raising your limit. If you are able to keep up with payments, the issuer may increase your borrowing limit and send you a ‘congratulations’ letter. It’s really only congratulations to them because they will be making more money. Credit cards make it easy to get approved. One credit card company may have dozens of cards and programs for different types of borrowers. If your credit score is too low for one program, they have another card just right for you. They can even get you a cash-secured card with high fees and lock you in as a customer. Issuers encourage you to use your credit card as an ATM. Your credit card may come with a ID number to use for fast cash at ATM machines. The problem is that these cash withdrawals usually include a fee or an interest rate even higher than your normal APR. Credit cards pull you in with low-introductory rates. That 0% for six months may sound like a great deal but have you ever paid off or closed the card after the six-month period? Credit card companies know they have you hooked and most of these sweetener deals come with the highest rates when the honeymoon is over. Understanding how credit cards trick you into overspending is one step closer to beating them at their own game. I don’t think you need to be completely debt-free and avoid all credit but the card companies are very good at their game. Know the psychology of credit and how it drives overspending to better understand how you can avoid the debt trap.